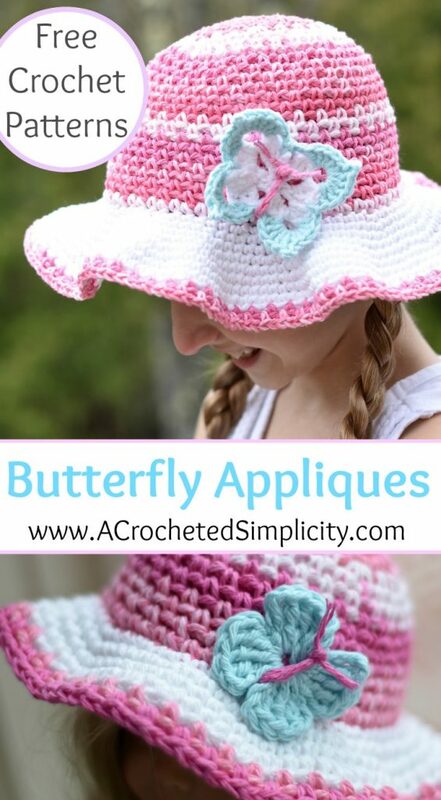 These cute butterfly appliques were designed to embellish the Kids Linen Stitch Sunhat. 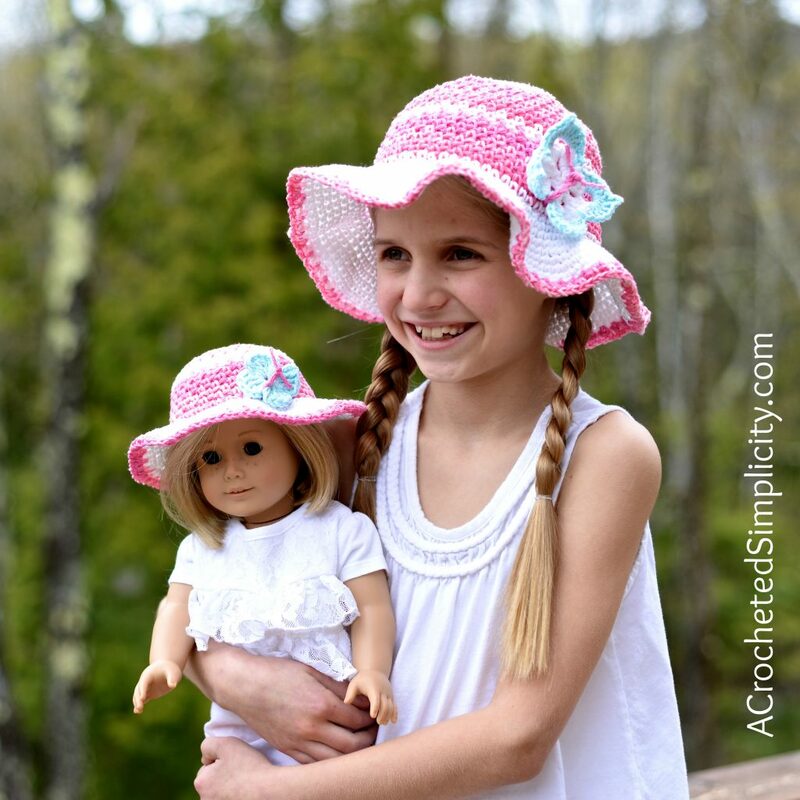 Claire asked for a new sunhat for her doll so I made a butterfly in 2 different sizes. Scroll down to see the photos of each. 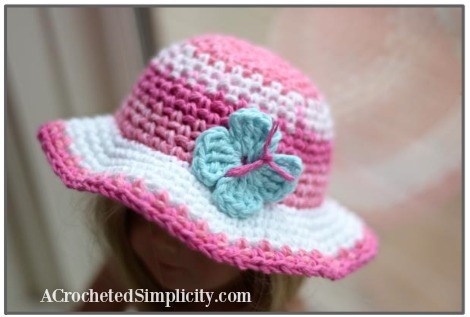 Click the photo above to be taken to the Kids Linen Stitch Sunhat pattern. Row 1 (MC): Begin with a Magic Ring, sl st into MR, (ch 6, sc in MR) 4 times. Do Not Join. Pull tail to tighten MR. See Photo A below. Row 2 (MC): Ch 3, Turn, [ (3 dc, ch3, 3 dc) in ch-6 sp from previous row ] rep from [ to ] in each ch-6 sp around, ch 3, sl st in last ch-6 sp. Fasten off. See Photo B below. Row 3 (CC): Join w/a sc between ch-3 & 1st dc of Row 2 (See Photo C below), ch 1, [ (5 dc, ch 3, sl st in 1st ch, 5 dc ) in ch-3 sp from row 2, sl st between dcs from previous row (See Photo D below) ] work from [ to ] 3 times, (5 dc, ch 3, sl st in 1st ch, 5 dc) in ch-3 sp from previous row, ch 1, sc between last dc & ch-3 from previous row (See Photo E below). Fasten off. Weave in ends. Continue below to the Body. Row 1 (CC2): Ch 21 (or whatever amount you need to reach approx. 4-1/2″ L). Fasten off. Trim ends to 1/2″ or whatever length you desire. Wrap body around the center of your wings and knot about 1/4″ from end of body (this creates a small head). See photo below. Fasten off leaving a 8” tail of yarn for attaching the butterfly to whatever you’d like to use it on. 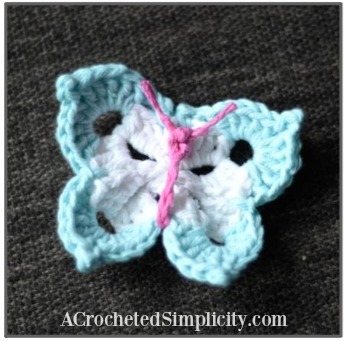 Butterfly Body: Using a 6” piece of yarn, wrap it around the middle of the butterfly twice then knot the yarn to secure (also creates the head of the butterfly). Trim the ends of yarn to 1⁄4” – 1⁄2”, to form the antennae as desired. See photo above.